Kunduz hospital bombing: The U.S. airstrike is looking more and more like a war crime. 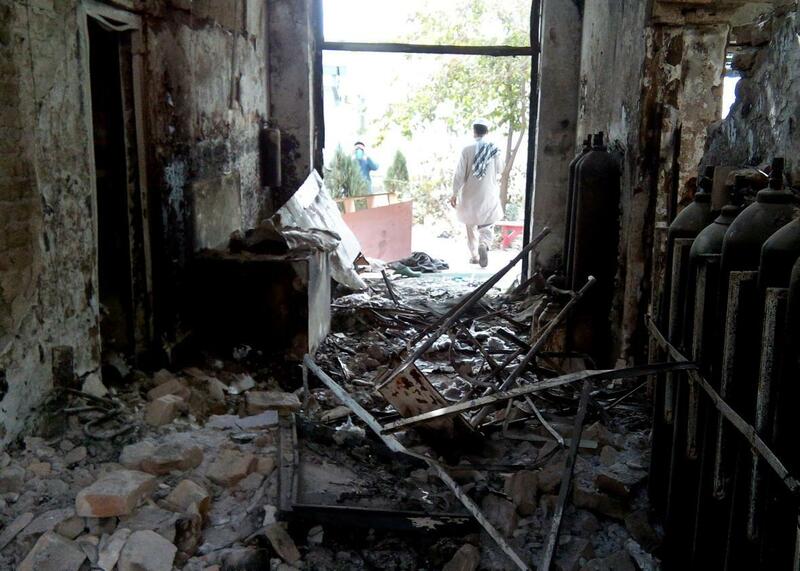 The damaged interior of the hospital in which the Médecins Sans Frontières medical charity operated is seen on Oct. 13, 2015, following an airstrike in Kunduz, Afghanistan. Whether or not the U.S. airstrike that killed 22 people at a hospital run by Doctors Without Borders (MSF) near Kunduz, Afghanistan, on Oct. 3 was a violation of international humanitarian law depends in large part on whether the military knew the site was a hospital, and if not, whether military officials took adequate steps to figure out what they were bombing. The latest reporting on the incident is not encouraging. On NBC Nightly News on Thursday, Pentagon correspondent Jim Miklaszewski reported that, based on the accounts of Defense Department sources, cockpit recordings from the AC-130 gunship involved in the incident “reveal that the crew actually questioned whether the airstrike was legal.” He also quoted a U.S. defense official suggesting that the attack “may in fact amount to a war crime.” The video and audio cockpit recordings of the incident, which feature conversations between the plane’s crew and U.S. troops on the ground, are at the center of the military’s investigation into the incident, as the Daily Beast’s Nancy Youssef reported last week. * The recordings have not been released publicly or even to the members of Congress who received a classified briefing on the incident. The AP also reported on Thursday that, before the bombing, U.S. special operations analysts had been gathering information on the hospital compound because they believed it was being used by a Pakistani operative to coordinate Taliban activity during the battle for Kunduz. It’s not clear whether the crew on the plane or the commanders who ordered the attack were aware that this intelligence was being gathered, but it is further evidence that the site was known to U.S. forces as a hospital. MSF also says it called the Pentagon while the attack was taking place. The defense official quoted in the NBC report acknowledged that the call took place, but the information was evidently not passed along to Afghanistan. While MSF acknowledges that it treated unarmed Taliban fighters at the hospital, it denies that the facility was being used by any armed group. There’s no evidence so far to suggest that any of those killed in the bombing were Pakistani. And even if the operatives were there, it would hardly justify complete destruction of a known hospital filled with civilians. The U.S. explanation for how the incident took place has shifted several times and the U.S. commander in Afghanistan, Gen. John Campbell, reportedly believes that U.S. troops did not follow proper procedure. MSF, which has alleged that a war crime took place, is calling on the U.S. and Afghan governments to consent to an independent investigation, a request that has so far been rebuffed. MSF has also charged that a U.S. tank that forced its way into the hospital compound on Thursday carrying a “U.S./NATO/Afghan investigation team,” damaged property at the site including potential evidence. A U.S. coalition spokesman told NBC, “We are aware of the incident and are looking into what happened.” One more for the growing list of questions. *Correction, Oct. 16, 2015: This post originally misstated the publication date of a Daily Beast article by Nancy Youssef. It was published on Oct. 10, not Oct. 15.